The new in colors will be available starting June 2nd, and I think you're going to like these colors! The base of this card in Tangerine Tangelo, the stripes are Lost Lagoon, the greeting is Mossy Meadow, the paint splotch in the bottom corner is Hello Honey, and the heart is Blackberry Bliss. 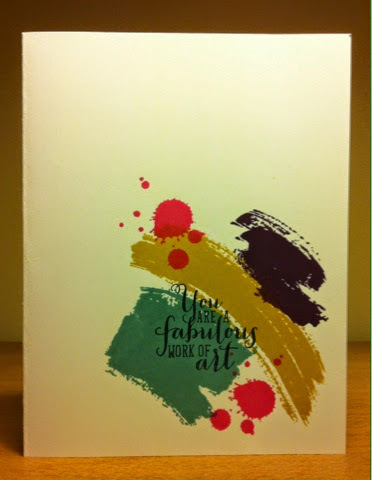 The 'painted' images are all from a new stamp set called Work of Art, and the greeting is from Yippee-Skippee! This second card also uses the new stamp set Work of Art. The streaks of paint are in Blackberry Bliss, Hello Honey and Lost Lagoon. The splatters are in Melon Mombo, and the sentiment is in Black StaxOn. 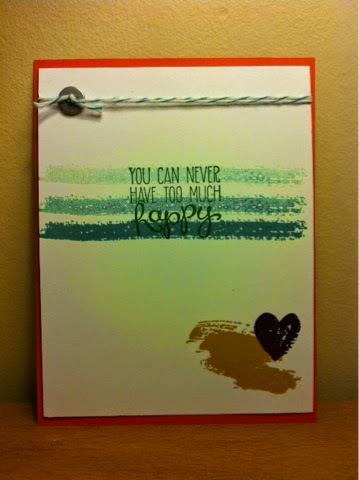 I just Love the simplicity of this card-- Whisper White card stock, a single stamp set and a few ink pads. I have a feeling I"ll be making more of these. 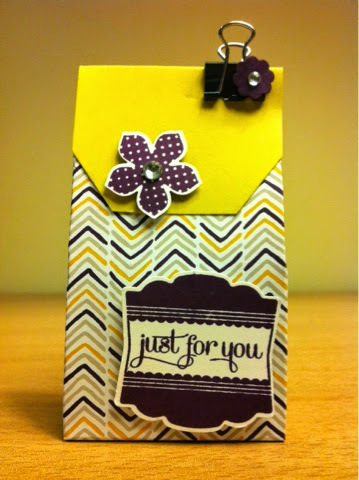 This little bag uses a sheet of Designer Series Paper from the new 4 1/2 x 6 1/2 paper stack, Moonlight. This design features Hello Honey and Blackberry Bliss. The closure on top is also Hello Honey using one of the tag topper punches. The tiny flower is punched with the Itty Bitty Punch Pack, the stamped flower is from Petite Petals, the greeting is from Label Love. All of these are in Blackberry Bliss. The DSP is scored along the long side at 1", 3", 4", and 6". It is scored along the short side at 1". This bag comes together pretty easily. Here is a link to a video of Sam Donald that shows how to make it start to finish. Her blog is full of wide variety of boxes and bags. When I need a packaging idea that's where I look first. I hope you've enjoyed this small taste of the 2014-2016 In-colours, there will be much more coming! Labels: Clean and simple, in-colors, Label Love, Moonlight, Paper Stack, Petite Petals, Punches, Rhinestones, Work of Art, Yippee-Skippee!